Tabloid journalism is easy to read and uses accessible language. The tabloids use eye-catching design and layout and write pithy, and often memorable, headlines. They will take risks to expose scandal, corruption and crime. Hence, they are more dedicated to investigative journalism. Much of what they expose may be distasteful and of little social consequence. However, the tabloids are not quick to let good taste get in the way of a compelling story. Tabloids and broadsheets look different, contain different news stories, have a different writing style and aim to attract different readers. Firstly, they differ in physical size. 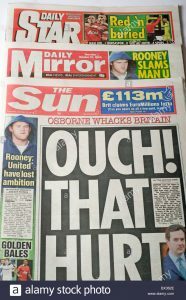 A tabloid is smaller and typically measures 11 by 15 inches, about the size of a folded broadsheet. It is usually no more than five columns across. Hence, tabloid stories tend to be shorter than those in broadsheets. Secondly, the kind of writing style and news reported also varies between tabloid and broadsheet. Known as the ‘popular press’ tabloids are better for entertainment articles and soft news. Their headlines are short and simple and often use rhymes, puns and cliches to grab their readers’ attention. Tabloids tend to sensationalise their stories, be much racier and more opinionated. Generally, they have a more irreverent and slangy writing style than the broadsheets. Because of their front-page banners, some UK tabloid papers are also known as the “red tops”. Broadsheets are concerned with ‘serious’ or ‘quality’ news. The broadsheet emphasises hard news – those stories which have a significant impact on society. So, they tend to use longer words and use more intellectual concepts. Their headlines are longer, factual and more serious. Where the broadsheets write about “the police”, the tabloids call them “cops”. In January 2019, The Guardian and Observer newspapers adopted a tabloid format. However, the change was purely a cost-cutting initiative. So, both papers continue to publish serious-minded content. They ceased printing newspapers on their own presses and outsourced that function to Trinity Mirror. These days, the term ‘tabloid’ refers more often to the style of journalism they publish rather the size of the newspaper. ‘Tabloid journalism’ is often used in a derogatory sense. Some tabloids have been successfully sued for publishing ‘fake news’ items. The tabloids took advantage of their press freedom to embark on an irresponsible culture of misinformation and sensationalism. Freddie Starr, the singer comedian, was the subject of one of the most outrageous examples of misinformation in the tabloid press. 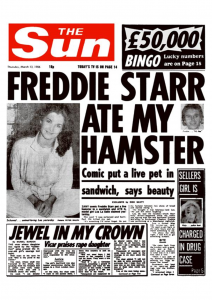 The infamous headline, “Freddie Starr ate my hamster”, was published in The Sun newspaper on 13 March 1986. The alleged incident took place when Starr had been staying at the home of friends in Cheshire. He’d returned home in the early hours of the morning from a performance at a Manchester nightclub. He was reported as having demanded that his hosts make him a sandwich; when they refused, he went into the kitchen and put their pet hamster between two slices of bread and proceeded to eat it. In 2012 Max Clifford, under oath, told the Leveson Inquiry into media ethics that The Sun ran the headline with his permission, despite the story being untrue. Clifford admitted he allowed the story to go ahead in order to drum up publicity for Freddy Starr.